As you can likely infer from the earlier discussion on power consumption and TBPs, in order to reach these higher clockspeeds AMD and their partners had to increase their GPU voltages. Relative to both our RX 480 and RX 470, the differences are quite significant. Overall voltages have increased by around 0.1v when using AMD’s reference clocks, and closer to 0.15v for the full factory overclocks. As a result the highest frequencies on these two cards are very expensive in terms of power, and it explains a great deal about why AMD needed to increase TBPs by 30-35W just to add another 40-80MHz to the boost clock. On the plus side, idle voltages are down for both RX 500 cards. Our RX 400 series cards idled at 0.8v, whereas the RX 580 and RX 570 idle at 0.7625v and 0.725v respectively. This has a minimal impact on a desktop card (especially wall power measurements), but if this is consistent for all AMD chips, it bodes well for the laptop-focused Polaris 11 and Polaris 12 GPUs. Moving on, let’s take a look at average clockspeeds. Functionally speaking, AMD’s boost mechanism is closer to a fine-grained throttle mechanism: the card always tries to run at its full, advertised boost clock, and will pull back if there’s not enough power available or it triggers thermal throttling. In practice, both the RX 480 and RX 470 regularly power throttled to a small degree; this allowed AMD to keep the cards closer to their optimal point on the clockspeed/power curve. Besides supporting higher clockspeeds overall, the higher TBPs of the RX 580 and RX 570 mean that these cards power throttle less often than their predecessors. To be clear, they still throttle, but the average degree of throttling across our game set is lower than with the earlier cards. This means that the RX 580 and RX 570 should be running closer to their maximum clockspeeds more often. It removes a bit of headroom, but it will improve performance. Adding the fully unlocked factory overclocks into the mix, and we find that throttling is further reduced. The factory overclock BIOSes on these cards have even higher power limits, so even with their higher clockspeeds, they throttle less often. 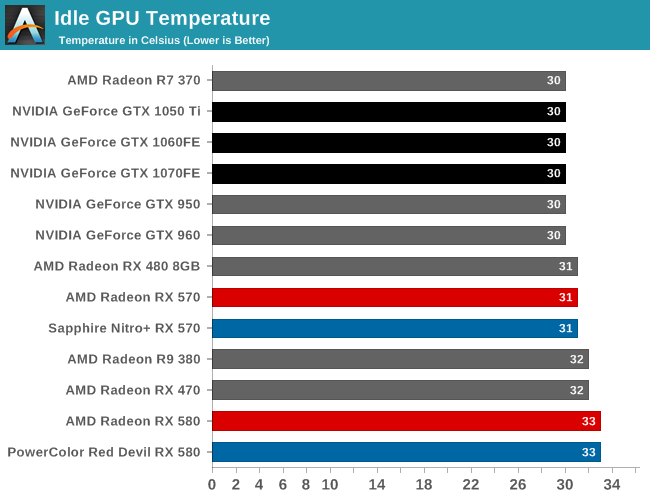 The PowerColor Red Devil RX 580 never averages below 1360MHz in a game, and the Sapphire Nitro+ RX 570 only shaves off all of 10MHz in two of our games. This is also why the factory overclocked cards are as fast as they are; the higher boost clocks are part of the story, but the reduced throttling further boosts performance over the baseline cards. After AMD fixed their Polaris idle power driver bug last year, AMD’s idle power numbers have been rather consistent. Earlier Polaris 10 cards averaged around 75W at the wall, and so do these newer generation cards. 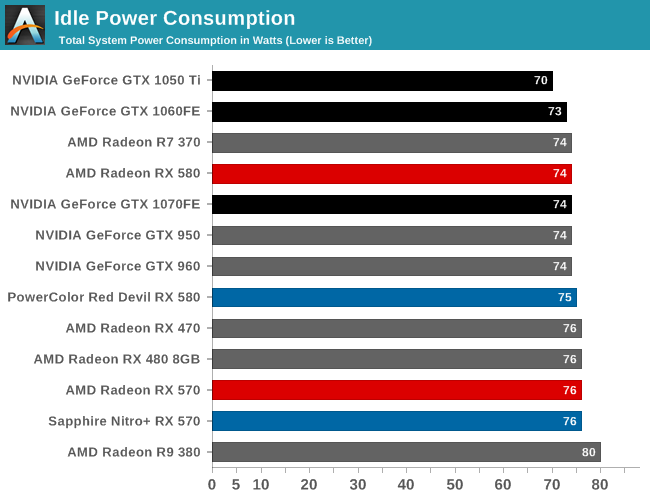 As for load power consumption, this is where AMD pays the piper, so to speak. Roughly in-line with AMD’s TBPs, power consumption at the wall has increased by a bit over 20W for both the RX 580 and RX 570 relative to their predecessors. At this point the RX 570 is approaching 300W, and the RX 580 is just shy of 325W. This puts the power consumption of the RX 570 at 10W under the GeForce GTX 1070, while the RX 580 is 17W above it. It goes without saying both are well above the GTX 1060 cards that AMD is competing with in terms of performance. Throwing in the factory overclocks further pours on the power. The Nitro+ system needs 330W here, and the Red Devil system 360W, each around 35W more than their reference-clocked configurations. 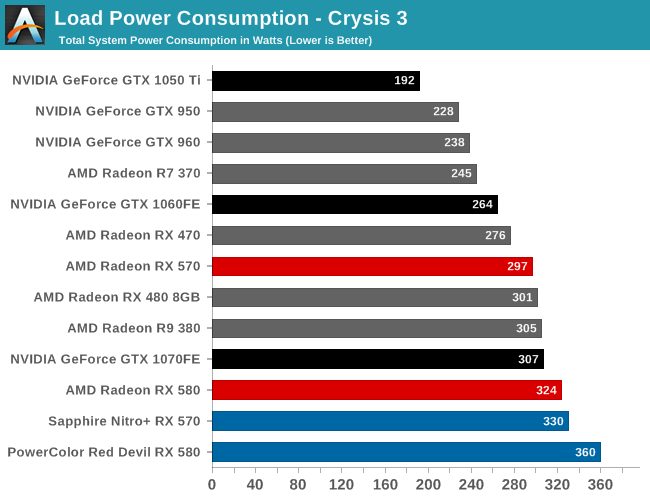 Bear in mind that this is total system power, so part of the increase comes from the higher CPU power consumption that results from higher framerates, but given the limited framerate difference from the factory overclock, the bulk of the power increase here does come from the cards themselves. 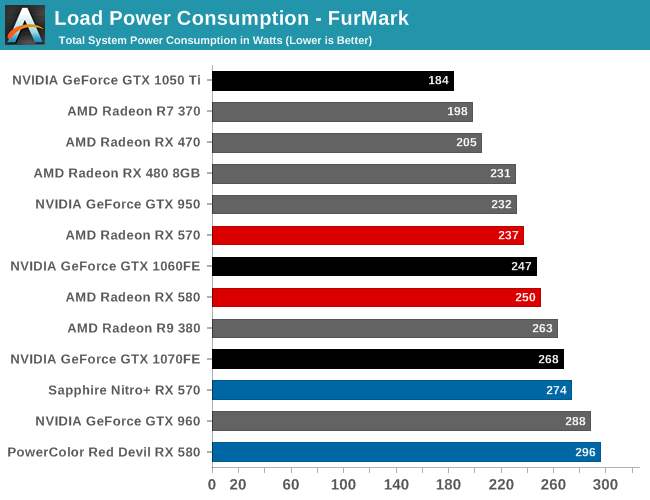 FurMark gives us a more focused view of GPU power consumption, and it tells a similar tale as Crysis 3. We’re looking at a 32W increase in power at the wall for the RX 570, and a 19W increase for the RX 580, the latter actually being a bit less than I was expecting. 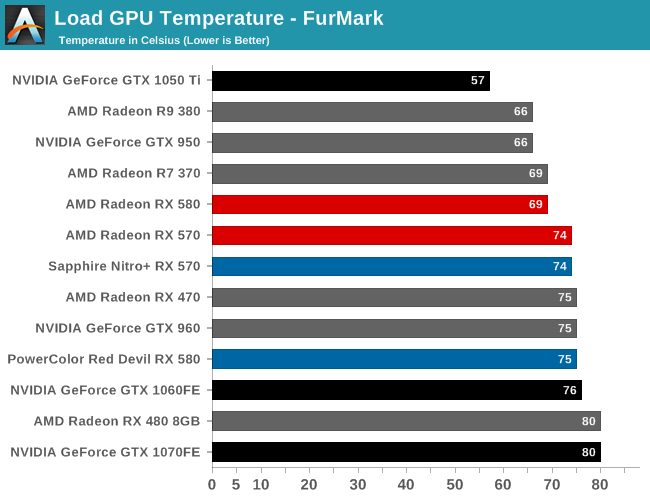 The new RX 500 series cards do look better against NVIDIA’s GeForce cards, but as I’ve previously mentioned in other reviews, in this generation FurMark only seems to be consistent between cards from the same GPU vendor. 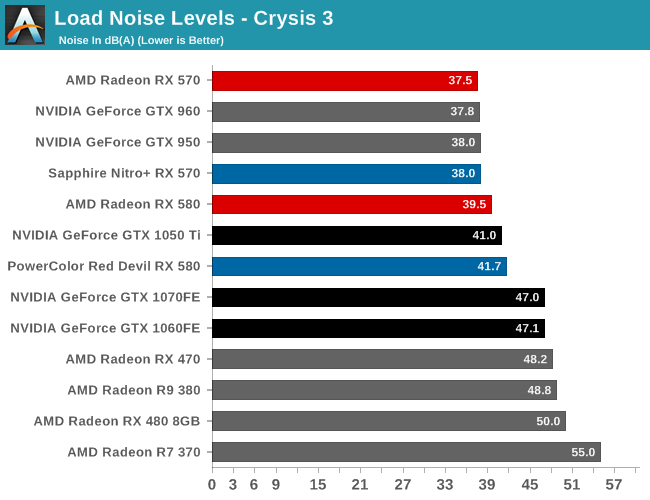 Cross-vendor comparisons are more accurate under Crysis 3. Meanwhile we get a second point of view for the power consumption of the factory overclocked cards. All-told, the higher factory overclocks cause FurMark power consumption to jump by 40W or so. FurMark is a pathological case of course, so games rarely (if ever) draw the same amount of power, but this shows why the factory overclocked cards don’t throttle as much. In their factory overclocked configurations, both cards have very high power limits. These limits are significantly higher than the original reference RX 480. For idling, both RX 500 cards implement zero fan speed idle. As a result their temperatures are a degree or two warmer than most of the pack. But idle power consumption is so low that these cards have little trouble dissipating that heat with just their heatsinks. 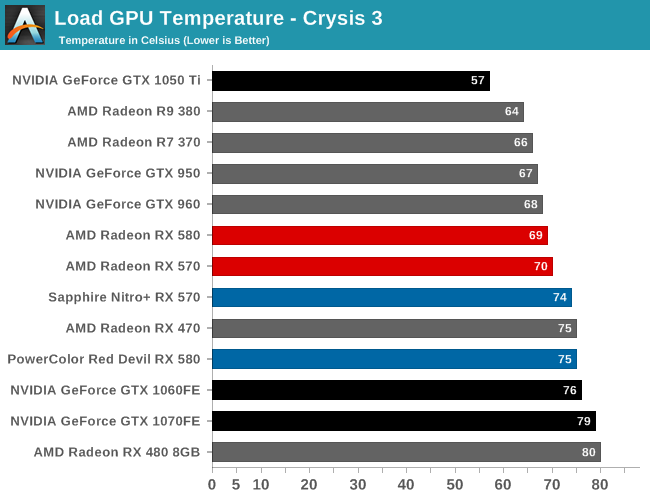 Judging from their temperatures under Crysis 3, both the PowerColor and Sapphire cards are tuned for a balance of noise and temperature. The open-air styled cards reach just shy of 70C when underclocked to AMD’s reference clocks, and 75C with their respective factory overclocks. With their massive coolers, neither card has any trouble with this amount of heat, they just aren’t spinning up the fans by too much to keep noise levels down. With FurMark the story is much the same as Crysis 3. As it turns out, both cards have a 75C soft cap; once the GPU reached that temperature, the fans will further spin up as necessary to keep temperatures from going any higher. It should be noted that neither card appears to temperature throttle, even under FurMark, as the power throttle is more than sufficient. Finally with idle noise levels, both cards are silent thanks to their zero fan speed idle implementations. The only noise that’s left comes from the rest of the GPU testbed. Moving to load noise, both cards continue to impress. The Sapphire RX 570 card, even when it’s running in its full factory overclock condition, barely gets above the noise floor; it’s dissipating 150W (or more) of heat in near silence. PowerColor’s Red Devil RX 580 fares similarly well; it’s under 40db(A) at AMD’s reference clocks, and only finally hits 42dB(A) when fully factory overclocked. Open air coolers have their strengths and weaknesses, but one thing is for sure: manufacturers have increasingly honed their hardware and fan speed algorithms, and these days are producing consistently awesome results. 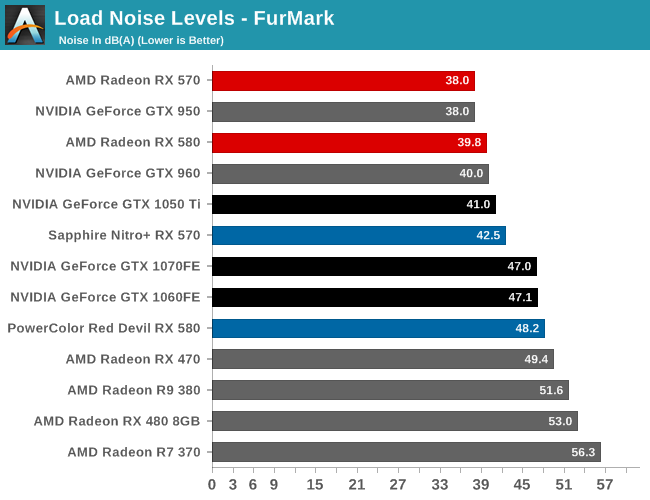 As for FurMark, noise levels do pick up as you’d expect. When underclocked to AMD’s specifications, both cards are still below 40db(A). It’s only once their factory overclocks and higher power limits kick in that noise starts to become meaningful. 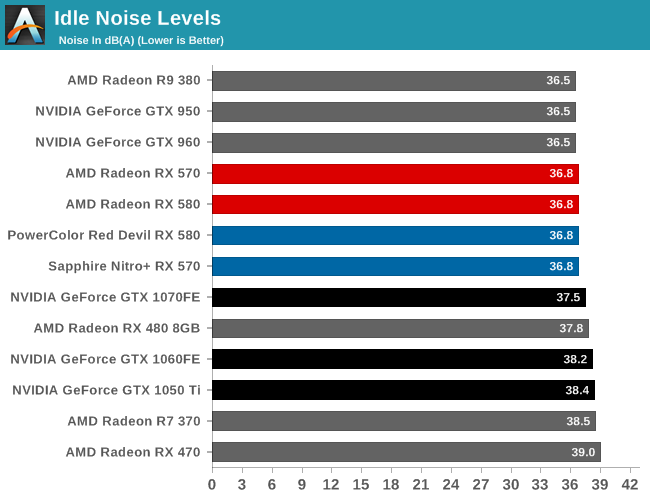 The Sapphire RX 570 holds to 42.5dB(A) here, while the Red Devil RX 580 only finally becomes a meaningful source of noise at 48.2dB(A). Though as the Red Devil has a rather high power limit, I doubt it will come anywhere close to this noise level under any gaming workload.